AUTO Generation Break 1: [Choose 1 face-down G Guardian from your G Zone, flip it face-up] When this Unit is placed on (GC), if you have a front row Rear-guard, you can pay the cost. if you pay it, during that battle, this Unit gains Shield+10000. AUTO: [Choose 1 Grade 1 or lower card from your hand, discard it] When this card is discarded from your hand for the cost of Calling “Divine Beast, Divine Maskgal” from your G Zone, you can pay the cost. If you pay it, draw 1 card. For Today’s Card, we’re introducing the following from “Fighter’s Collection 2017” (on sale May 12th, 2017): The Generation Break 1 《Royal Paladin》 G Guardian, “Divine Beast, Divine Maskgal” and the Heal Trigger “Maskgal” that activates its ability when it’s discarded from the hand for the Cost of Calling the related G Guardian. When “Divine Beast, Divine Maskgal” is placed on the Guardian Circle, if you have a front row Rear-guard, it gains Shield+10000! If you can meet the conditions, it’s a reliable additional 10000 Shield without need for a Counter Blast or Soul Blast. Since 《Royal Paladin》 is a clan that specializes in Calling Units from the Deck, so activating its effect is relatively easy. Aim aggressively for 25000 Guard. 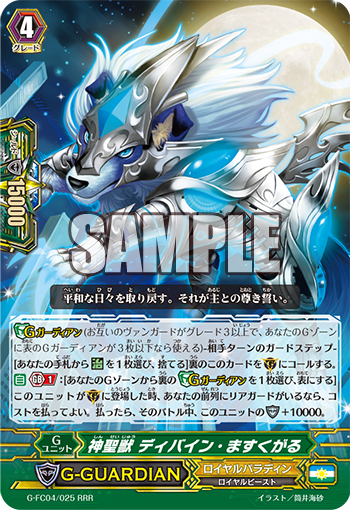 Continuing, “Maskgal” can activate its effect when discarded to pay the cost of Calling “Divine Beast, Divine Maskgal”. By discarding 1 Grade 1 or less card, you can draw 1 card. By recycling your hahnd, you can prepare for next turn’s counterattack! From here on, we’ll be continuing to introduce various cards included in “Fighters Colletion 2017”! Please enjoy!